Get on your batting glove and dust off home plate…it’s nearly time to PLAY BALL! 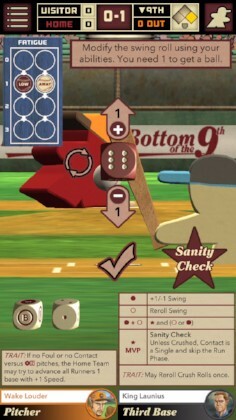 After an initial reveal at PAX East earlier this year, Handelabra (Sentinels of The Multiverse) has just announced that its highly anticipated digital port of Dice Hate Me Games’ baseball-themed card and dice strategy tabletop game, Bottom of the 9th will be getting a Gen Con release, launching on Thursday August 17th. As a backer and owner of the physical game, I can’t wait to check out this digital adaptation. No word on the pricing yet, but we’ll definitely have more details for you when we take the mound to check this one out in a couple of weeks. For more details visit BOT9DIGITAL.com and watch the catchy trailer below.